Régis Bouvier in Marsannay produces high quality red, white and rosé wines of premier-cru quality without that classification. The lieu-dit Bourgogne Rouge En Montre Cul vineyard is of a quality well above most as the vines are cultivated on a steep slope, not flatland Bourgogne. The vines are cultivated on a steep hill-side lieu-dit vineyard in the northern part of the Bourgogne AOC. “Montre Cul” means “showing your rear”—the vineyard is very steep, so when harvesters are picking the grapes they have no choice but to look up at the rear of the person above them (Bouvier is not being cheeky here, this is a historical, official name for the vineyard.) 20-day long maceration in temperature-controlled stainless steel followed by ten months of ageing in 3-4 year old oak barrels. 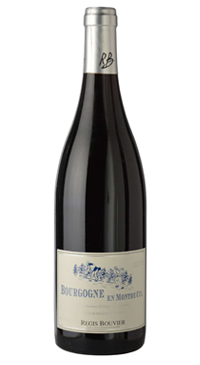 Bright red berries and herbs on the nose, crisp red fruits on the palate, some spice and purity.